Now I'm at 28 weeks, it's time to give some serious consideration to what I need for this baby and so over the coming weeks I'm going to share my shopping trips and top picks with you. You may have seen my post last week about moses baskets- I found a bargain at Kiddicare, so take a look! Whether we breastfeed or formula feed, it's inevitable we'll still need to sterilise and so I posted on Twitter recently for your suggestions about the best sterilisers as after all, mums know best! There's so much choice out there, and the prices vary considerably. With my first little one I used a cold water/microwave steriliser, and had an electric steriliser at home with Oliver which I used for sterilising my expressing equipment. During our time on neonates alone we were at four different hospitals, and all but one of these hospitals used the cold water method. Presumably this is because of cost and ease of use, but equally the NHS have very strict guidelines, and we're talking about some really sick and prem babies, so no chances can be taken when it comes to making sure all those pesky germs are eradicated. With Oliver, his immune system was incredibly compromised, and so we always had to ensure that any cups, spoons etc were sterilised way beyond the usual 12 month recommendation. Milton have very kindly sent me a cold water/microwave steriliser, and so this is what I plan on using this time around. To be honest, I am a fan of cold water sterilising as it's easy, it's cheap and everything gets fully submerged, whereas with steam sterilising I'd always be a bit paranoid that there could be blackspots that might not get treated. So what are the pro's of this steriliser? Sterilises from 2-6 minutes in the microwave (depending on power) and in 15 minutes with cold water- perfect if you're in a rush! Easy to use on the move, simply fill with water and chuck in tablets or sterilising fluid- there's no need for a plug socket or microwave. 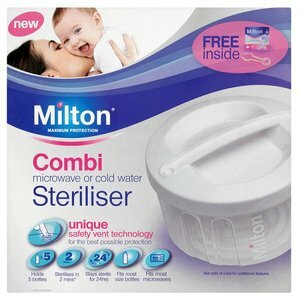 The steriliser I have is the Milton combi, pictured above, and available from a range of stores including Superdrug where it is £24.99.